So I guess I’m totally out of practice because I neglected to take even one picture of this recipe… I guess I’ve been away for too long and have just lost my mind. Oh well, I went ahead and borrowed and image that was the closest image to what my meal looked like and as it turns out BraunAppetit has some pretty cool recipes as well. Well I really have been working very hard at changing how I eat, how I cook and how I think about food. I’ve been much more focused on the science behind foods and how your body processes the foods that we eat. (By the way this was all brought about by stupid Diabetes) But since I have started to focus on different ways to eat I have learned that no many places offer healthy choices for a diabetic that are also tasty although there are a few exceptions. 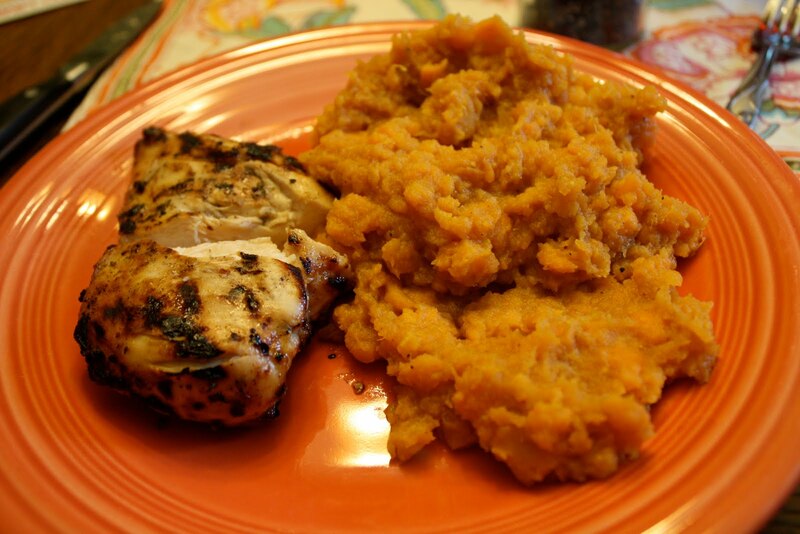 The other night my girlfriend and I met up with some friends for dinner and my buddy recommended the fire grilled chicken and yams, now that may not be the absolute best option but was surely headed in the right direction so I tried it and HOLY CRAP THIS IS AWESOME! Now I later found out that they do add sugar in a few areas so it’s not the most diabetic friendly meals but was much better than pasta or white bread… But me being me decided that I would just make my own recipe that is diabetic friendly and incorporates everything that I wanted in a meal. So the next day it was off to the grocery store with a specific list of items and here is what I ended up doing! Oh by the way, even the kiddos enjoyed it so get ready to blow everybody’s mind even the youngins’! If you have ever had yams or sweet potato souffle then you know that it’s usually topped with candied pecans, well those are always covered with sugar but I still wanted them. So, I mixed half of my melted butter, the sugar free maple syrup, splenda brown sugar and vanilla extract into a bowl. I then added the pecans and mixed until each pecan was fully coated, and poured onto a baking sheet. Don’t forget to add your non stick spray to this pan or you will be forever trying to remove candied candy stuff from the pan. I then put the pan in the oven at 350 for about 25 minutes and then let cool. These things came out as a delicious snack all by themselves but that’s not why I made them. This was the easy part of the meal… I just added garlic salt, cajun seasoning, black pepper, and cayenne pepper and fully covered both sides with this mix. You can pretty much season the chicken any way you want but I have found that the spicy chicken works best with this meal. I think grilled the chicken over direct heat until done, it took about 20 minutes. Once everything was done, I plated it all up and crushed a few of the candies pecans and put them over the sweet potatoes with the spicy chicken on the side. All in all there were very few simple carbs in this meal and the complex carbohydrates and fiber make it a very healthy and diabetic friendly meal, not to mention that it was absolutely delicious to boot. I’m pretty sure this dish will end up being a regular thing around our house!